The American Civil War was an issue of politics: federal vs state rights! These issues existed from the early days of the United States when the Declaration of Independence in 1776 declared a new nation. However at the end of the Revolutionary War, though the original 13 states had some of their concerns addressed through the Articles of Confederation, an agreement ratified in 1781, no government structure was in place. In the opinion of nationalists, the Articles were weak because they had no provision for a chief executive leader, or a president, a concern for George Washington. The states retained local power under the Articles, which later became a part of the U. S. Constitution. So the role of the national government continued to be a thorny issue for the United States. Many Northerners believed in the politics of federalism, that is a strong central government that holds power over weaker state governments. The rebellious Southern states did not want the federal government controlling their lives; their agricultural economy was heavily dependent on slave labor for the production of cotton, which was their main product. The term 'King' was used to describe the status of cotton, which was distributed to Northern textile mills and throughout the world. Until tensions reached a boiling point during the American Civil War time frame, some Northerners and Southerners had strong economic, cultural and family ties. Yet, the states divided politically. 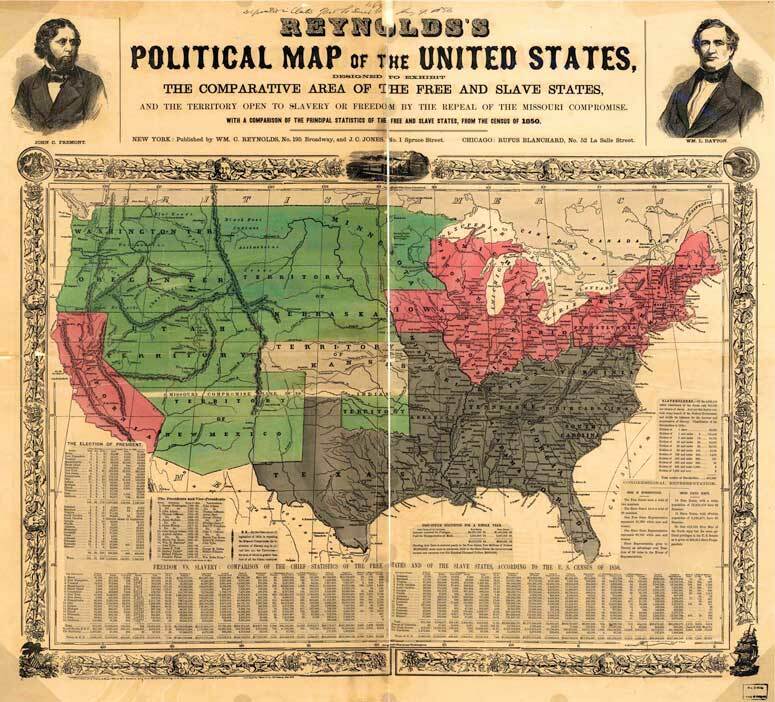 The 1856 map (above) shows the slave states in dark grey, while the free states are in pink. The North utilized their labor pool to maintain their industries, while the South maintained their agricultural focus. Although some of the cotton from the South found its way to the northern textile mills, most of it went to Great Britain and France. In return, the South got most of its manufactured goods from overseas, not the North. The North got much of their food from the western states and not from the South. So when Congress leaned in favor of northern representatives, higher tariffs were put on imported goods; as a result, the South was more affected than the North. Southerns felt the squeeze more than northerners. Higher tariffs meant that southerners had to pay more, and of course, Great Britain and France could not buy as much cotton. The Southern states found themselves increasingly outvoted in Congress on issues, like tariffs, that impacted their way of life and favored northern states. The Tariff of Abominations was enacted in 1828 and further enraged and divided the country. The Tariff affected the Southern states more than those in the North by forcing them to pay more for manufactured goods while increasing the cost of raw materials they could sell. It taxed certain manufactured goods as high as 45% (exports) and also highly taxed wool (imports). Though the Tariff of 1832 sought to reduce the tax rate, South Carolina nullified both tariffs and went so far as to make preparations to secede if the federal government tried to forcibly collect the taxes. The Northern economy was based on manufacturing, which did not use slave labor. Senator Henry Clay helped to ameliorate the situation and worked out a compromise that lowered the taxes even further—the Tariff of 1833.